Just came across this beautiful CD cover image on Amazon and had to share it. One used at $106! Yikes! I would otherwise love to own this one for the cover even though I already have a copy. Last edited by Fritz Kobus; Nov-14-2015 at 17:14. One can dream can he? Mr FLorestan, when you finish the version Martha with Victoria de Los Angeles, please write a review on that version. Wow, I missed this and should have responded long ago. 1. The sung-in-English version will never replace the original language set with Lucia Popp. 2. The English one is a lot of fun. I would not be without it. 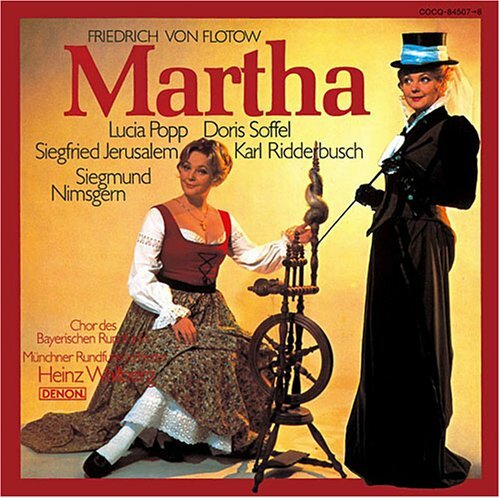 "Martha" teems with melody. The best known airs are "The Last Rose of Summer" and Lionel’s "M’appari" (Like a dream). The best ensemble piece, a quintet with chorus, occurs near the close of Act III. -- "Ah! che a voi perdoni Iddio" (Ah! May Heaven to you grant pardon). The spinning-wheel quartet in Act II, is most sprightly. But, as indicated, there is a steady flow of light and graceful melody in this opera. Almost at the very opening of Act I, Lady Harriet and Nancy have a duet, "Que sto duol che si v’affano" (Of the knights so brave and charming). Bright, clever music abounds in the Richmond fair scene, and Lionel and Plunkett express their devotion to each other in "Solo, profugo, regetto" (Lost, prescribed, a friendless wanderer), and "Ne giammai saper potemmo" (Never have we learned his station). Then there is the gay quartet when the two girls leave the fair with their masters, while the crowd surrounds Sir Tristan and prevents him from breaking through and interfering. It was in this scene that the bass snger Castelmary, the Sir Tristan of a performance of "Martha" at the Metropolitan Opera House, February 10, 1897, was stricken with heart failure and dropped dead upon the stage. Last edited by Fritz Kobus; Jul-02-2017 at 17:34. 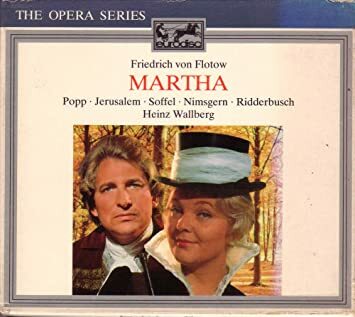 Not enough good recordings of Martha out there. It was in this scene that the bass snger Castelmary, the Sir Tristan of a performance of "Martha" at the Metropolitan Opera House, February 10, 1897, was stricken with heart failure and dropped dead upon the stage. The mention of death always brightens my day. I wonder how many singers have died while performing? Just imagine Tristan and Isolde being unavailable for their curtain call. Singers and ballet dancers actually dying in death scenes. Sounds like a great plot for a Vincent Price movie! Best would be for the tenor in Tosca to actually die, since his character is executed during a supposed mock execution that turns out to be real. Someone could substitute real guns for the stage props - maybe the tenor himself, in an act of suicide, or perhaps the soprano, in act of revenge for a high note held too long. Last edited by Woodduck; Jul-05-2017 at 05:49. I have wondered what if they had a collapsing knife that didn't collapse and Tosca actually did skewer Scarpia in the heart and he really died on stage. Any time you try to simulate a killing with reality, the possibility of a real killing looms over the whole thing. Besides that, surely quite a few opera singers have been injured while performing (Didonato's broken leg in Barber of Seville for example). Well there is that perverse sense that every time someone else dies you just got spared, so I guess it is a day brightener in that sense. Reminds me of when an someone died who had retired from my office a long time ago so that a lot of people currently working there would not know who it was. When I mentioned that this guy died, a co-worker quipped, "Better him than us." Last edited by Fritz Kobus; Jul-05-2017 at 06:40. All times are GMT +1. The current date and time is Apr-24-2019 23:00.